We are always looking for movies that can be enjoyed by our entire family. Since we love going on outdoors adventures together, I knew that Against the Wild would be a hit and it definitely did not disappoint us! Written and directed by Richard Boddington and recently released by Anchor Bay Entertainment, Against the Wild features Zach Wade, his little sister, Hannah and their loyal dog named Chinook, an Alaskan Malamute. As the trio are headed out to visit with their father for the weekend, their small plane has engine problems and must make an emergency landing in the vast wilderness. The glorious backdrop has stunning visuals but is full of potentially dangerous situations for Zach, Hannah and Chinook. There are ferocious grizzly bear encounters, wolves and forest fires as the three attempt to work together in order to seek help as they must walk to safety. The tension mounts as they endure the harsh conditions in their effort to make their way back home to their parents. My children were captivated throughout the entire film and even spent the afternoon role playing together in our back field where they built their own “survival shelter” out of branches and hay. This adventure film is dramatic, exciting and appealing for both children and adults which makes it the perfect family film. I appreciate the theme of loyalty, courage and love presented in this film which sets a good example for my three children ages 6, 7 and 8. It is rated PG for action and peril but there was nothing that I found inappropriate or overly frightening for my younger children. I was very impressed with the child actors’ performances as well as the canine star. As a mother, I can relate to the parent’s agony as they searched for their beloved children and could imagine how fearful they would have been. 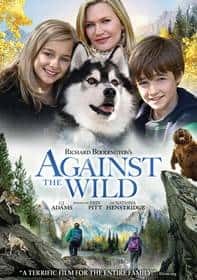 Against the Wild is available for purchase at Walmart stores for the first time as a DVD and digital download with a SRP of $24.98 (I found it online for the excellent price $12.96 at Walmart.com). If you are looking for a wholesome action and adventure movie that everyone can enjoy then I highly recommend watching this film.